Development of the system will be funded entirely from the federal government budget. A secure line of communications will link all Russia's defence companies, enabling a real-time exchange of all kinds of information, including information classified as top secret. All defence companies in Russia are set to be interlinked. Existing lines of communication within every company will first be checked. Once this is done, installation of the new equipment will begin. According to the procurement documents, all the equipment and software must have "the necessary means to protect information and combat foreign technical intelligence". Creating a single warfare system could involve dozens or even hundreds of companies whose personnel are not permitted to share documents the way ordinary people would; by email, or, to discuss certain work issues over Skype. All this slows down work, because defence personnel have to use older, more secure methods of communication, like sending correspondence in hard copy via special couriers, speaking over secure telephone lines, or meeting in person. The new system is designed to overcome these problems. "We are bringing technical capabilities to a new level and creating a single secure information space for Russia's entire defence industry. The system being created will enable companies to use all the possibilities of modern telecom technologies, and guarantees a high level of information security," said Alexander Kalinin, Director of the Department of Innovative Development of the United Instrument Manufacturing Corporation. The terms of reference state that the new system will allow personnel at secret facilities to use everyday tools such as email, audio and videoconferencing and cloud storage for work purposes. 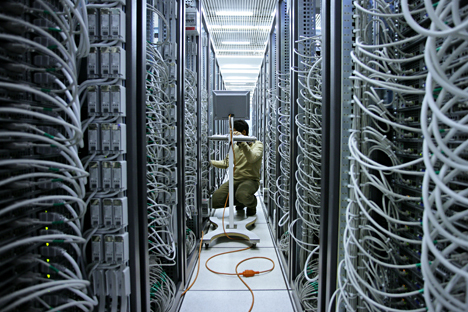 Once the defence industry gets its own "Internet", engineers will be able to take advantage of powerful information and computer resources, such as the Computer Modelling Centre (a supercomputer) being created at the Vega Radio Engineering Corporation in Moscow. According to the publicly available procurement documents of the Russian Ministry of Industry and Trade, the customer for the new system, it will be implemented at 255 Russian defence industry companies in 2016. The United Instrument Manufacturing Corporation's press release, however, mentions a figure of more than 1000 companies. This difference most likely indicates that the programme is designed to run for a number of years. Development of the system will be funded entirely from the federal government budget, but the amount to be spent has not been disclosed. A notable requirement for the "secret Internet" is that all its hardware and software must be made in Russia. This will prevent "backdoors," or vulnerabilities deliberately created by foreign manufacturers, which may subsequently be used by intelligence services from those countries to gain access to secret information.